TRAXALL 770/720 receiver displaying two transmitters simultaneously. Nearest (Filled Yellow) and farthest (Superimposed Purple Line). 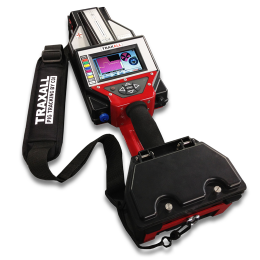 For users that don't feel that they need the full capability of tracking 8 transmitter frequencies simultaneously, the TRAXALL 720 offers every feature from the TRAXALL 770 but has a lower price point and tracks fewer frequencies - 3 instead of 8. 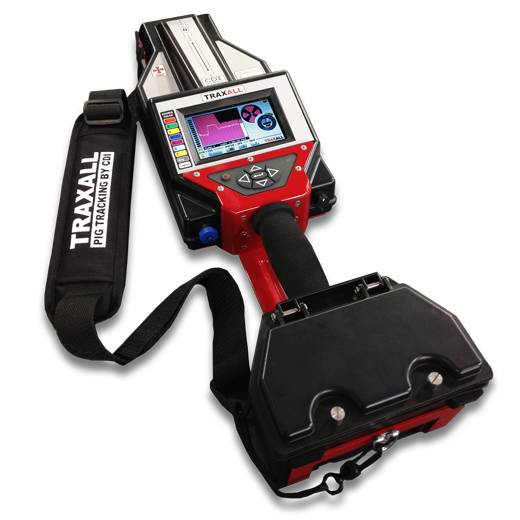 Passage detection, Pinpointing, and launch/receive verification of MFL inspection tools is a breeze with TRAXALL 770/720 advanced permanent magnet tracking and locating capabilities. The system's graphical user interface for MFL shows familiar zero-crossing signals with full Pinpointing, recording and passage monitoring. The system's Bluetooth wireless feature allows downloading of recorded passages, Waypoints, Trackpoints, and remote viewing of the system from a vehicle in inclement weather. 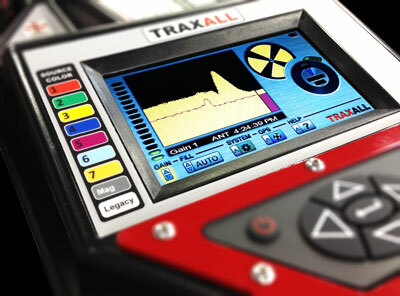 As another industry first, the TRAXALL systems may be equipped with a CDI LineStat radio system. LineStat provides the ability to autonomously monitor for pig passages and send remote notifications as emails or text messages. LineStat requires no cellular telephone network and functions anywhere in the world.